Cloud Service Providers can give you reports on your cloud resources, but that’s only one part of the picture. WhatsUp Gold treats the cloud just like the rest of your network and displays that information in context with the rest of your network infrastructure. You can monitor, report and alert on the status of every single metric available via the AWS and Azure APIs. You can then integrate that information into your alert center, dashboards and your interactive network map. 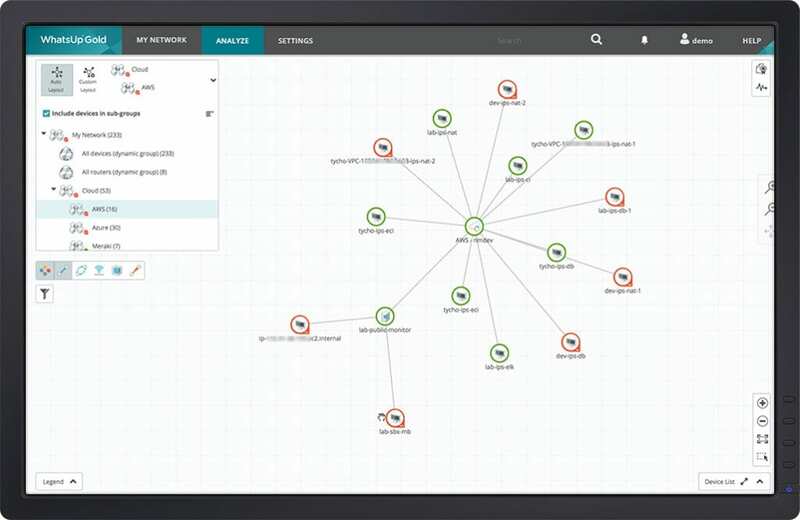 WhatsUp Gold software will automatically discover cloud-based resources and display them on the same interactive map that shows your on-premises network. 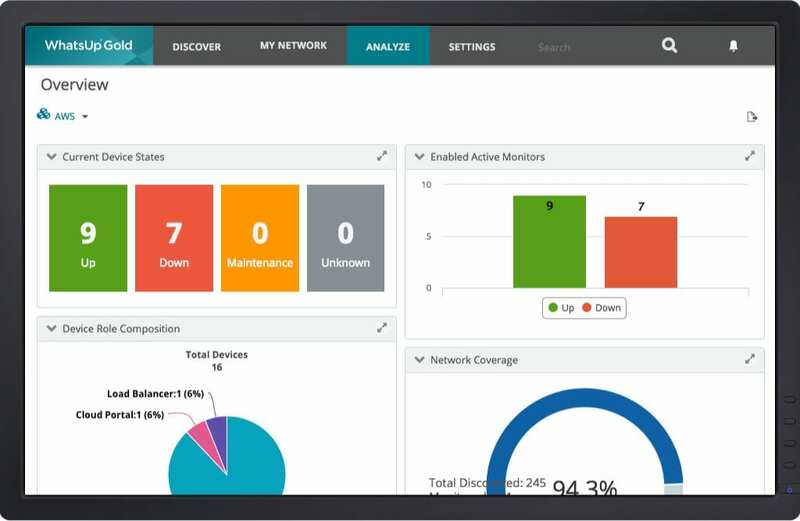 Not only can you now view and modify them like any other device, you get end-to-end visibility of your entire networked infrastructure for faster troubleshooting. Every parameter accessible through the Amazon AWS or Microsoft Azure cloud APIs can be monitored by WhatsUp Gold. Problems are highlighted right on the map for at-a-glance troubleshooting. 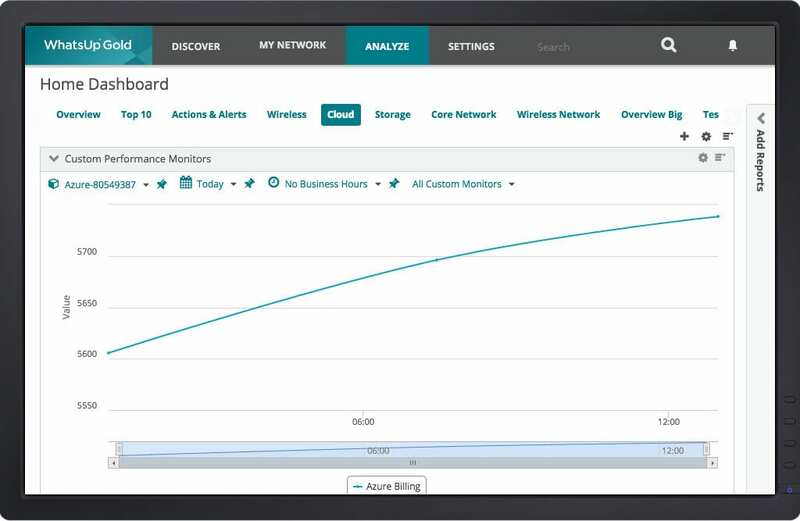 Drill down with a single click to view performance and availability details for any cloud-based resource. Track and alert on cloud usage and billing so there are no surprises in the next invoice. Proactively alert on performance issues impacting key services. Set your own threshold-based alerts on key performance and availability metrics and get notified via Email, SMS, Slack or log files.